A few days ago, I wrote again on China’s communist social credit system – this also applies to Google and Facebook. But we have our own system being utilized here in the United States in the form of Google, Facebook, Twitter, and other Internet platforms. I have already been purged from Facebook for my political views. Many other conservatives have as well. Twitter is also cracking down. They just permanently banned conservative writer, radio host, and combat veteran Jesse Kelly. In retaliation for that, Instant Pundit’s Glenn Reynolds quit Twitter yesterday. I can’t say that I blame him for it either. People seem to want more, and although there’s nothing duller than posting a screed on why you’re quitting a platform, here’s the gist: I’ve never liked Twitter even though I’ve used it. I was a late adopter, and with good reason. It’s the crystal meth of social media — addictive and destructive, yet simultaneously unsatisfying. When I’m off it I’m happier than when I’m on it. That it’s also being run by crappy SJW types who break their promises, to users, shareholders, and the government, of free speech is just the final reason. Why should I provide free content to people I don’t like, who hate me? I’m currently working on a book on social media, and I keep coming back to the point that Twitter is far and away the most socially destructive of the various platforms. So I decided to suspend them, as they are suspending others. At least I’m giving my reasons, which is more than they’ve done usually. Instant Pundit was one of the first bloggers out there and drives huge amounts of conservative traffic. We call it an ‘Instalanche’ when Glenn puts out a story you have written or are connected to. He’s had it with this censorship and he won’t be the last by any means. Google has filed for some new patents that are so invasive, it boggles the imagination. They could soon be eavesdropping on our movements, moods and even how children are behaving at the home. Amazon is doing this too and we invited them in with Google Home and Alexa. The patents, which could lead to the development of new smart-device technology, would solidify Google’s presence in the home and in turn help it learn more about people’s preferences, activities and make suggestions accordingly. It would have access to everything: appliances, televisions, phones, alarm systems, etc. and it would actively spy on everyone in the home as well. This is ‘Brave New World’ on steroids. The patents will produce products such as Google smart cameras that will be capable of recognizing an image of a celebrity on someone’s t-shirt, connect that image to the person’s browsing history, see they are a fan and then send the person an ad for a new movie the star is in. These cameras could also scan clothing and estimate income and tastes based on any expensive electronic devices it detects. The smart home could then recommend what to watch and where to shop. Some will say, “So what?” Well, that’s just the beginning. We are tech geeks in my family. My husband is a software engineer and I’m a computer troubleshooter. We will never have these devices in our home no matter how much easier they make your life. They are far too invasive and frankly, dangerous. Google and Facebook’s eyes and ears will be everywhere if their products are successfully marketed out there. In another Google patent, a smart-home system is described that would act like a watchful nanny observing children’s behavior in the household. ‘Occupancy sensors’ would alert a parent when kids are in the house and a smart lighting or audio warning system could be triggered to warn the children if they were in an area that was out of bounds. A second patent proposes a smart-home system that would help run the household, using sensors and cameras to restrict kids’ behavior. Parents could program a device to note if it overhears ‘foul language’ from children, scan internet usage for mature or objectionable content, or use ‘occupancy sensors’ to determine if certain areas of the house are accessed while they’re gone— for example, the liquor cabinet. The system could be set to ‘change a smart lighting system color to red and flash the lights’ as a warning to children or even power off lights and devices if they’re grounded. Imagine what they could do to all of us. Think of your own home and the Internet banning you from drinking, smoking, over-eating etc. And consider these gadgets reporting you to the police or the government for perceived misbehavior. Speakers could also be used to relay mountains of information back to Google. Google can make inferences on your mood based on whether it hears raised voices or crying, on when you’re in the kitchen based on the sound of the fridge door opening, on your dental hygiene based on ‘the sounds and/or images of teeth brushing,” The Atlantic reported. If the patents become products, it appears that they will go much further than the current Google Home speaker, that answers questions and gives information, or the Google-owned Nest thermostat that measures temperatures in the home. These devices will record if you are depressed, they will count how often you open the fridge and what you eat and they will control the temperature of your home – all for your own good, dictated by the powers-that-be at Google. Google is already messing with search results just as Facebook is. They censor and manipulate what you get to see. They are trying to control politics and who runs the country as well. If that is not a move towards totalitarianism, I don’t know what is. There is a film out called ‘The Creepy Line‘. It’s an 80-minute documentary now streaming on Amazon Prime that I recommend you watch. There is a trailer for it below. The film delves into some of the troubling habits of our two Internet masters, Facebook and especially Google. 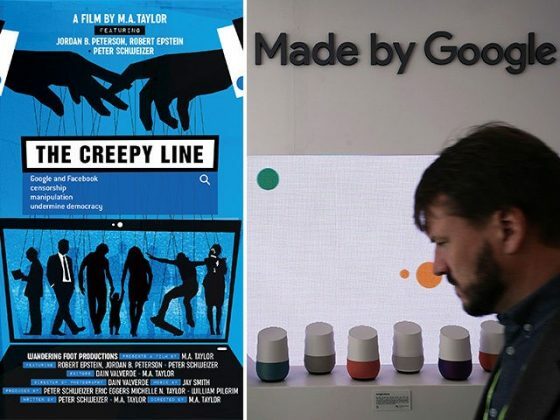 An early segment of the film, produced and partly narrated by the journalist Peter Schweizer, illustrates how your search history gives Google an enormous, permanent cache of information about you, everything from what things you like to buy to what you like in bed. Naturally Google uses the data mainly to fine-tune ad sales. But what else might they do with it? Who knows? Facebook has become the No. 1 source of news for Americans, and has already been revealed to censor conservative news items and downplay trending stories that were favorable to conservatives. Engineers also said they were inserting stories into the news feed that they preferred people to see. Facebook could influence elections invisibly by sending out messages only to certain individuals urging them to get out and register to vote. Even the Guardian used the term “Orwellian” to describe Facebook’s tactics. But as the tech guru and author Jaron Lanier notes, we’re not citizens of Facebook, so we have no vote in how it runs, no access to the details about how it decides what information to show us. There is no transparency about what’s going on. Between them, Google and Facebook are effectively a duopoly with unprecedented influence over American lives and minds. The federal government is, meanwhile, a heavy user of Google products, and has shown little interest in oversight. We’ve only begun to take notice of the way the state is merging with the most powerful corporations. Psychologist and Google critic Robert Epstein found that, by sheer coincidence, the day after he wrote an article called “Could Google Tilt a Close Election?” he couldn’t access the Internet through any browser. An especially chilling passage shows Epstein explaining how his research shows that manipulation of search algorithms to favor a given candidate could easily shift people’s voting intentions, with few noticing the bias. He suspects such manipulation in searches for Hillary Clinton during the 2016 campaign, which Google has denied. Spooked yet? If you aren’t, you haven’t been paying attention. The tech giants must be broken up under antitrust laws to keep America free and to keep our constitutional rights in play. Despite leaked video footage showing top executives declaring their intention to ensure that the rise of Trump and the populist movement is just a “blip” in history, Google has repeatedly denied that the political bias of its employees filter into its products. But the 85-page briefing, titled “The Good Censor,” admits that Google and other tech platforms now “control the majority of online conversations” and have undertaken a “shift towards censorship” in response to unwelcome political events around the world. If you think our privacy is being invaded now, you ain’t seen nothing yet. We have to pass legislation to protect our privacy and rights before it is too late. Otherwise, there is no telling who our information will be sold to and who, in the end, will control our lives. It certainly won’t be us. What China is doing is terrifying, but we are really doing the same thing. Cameras are everywhere, databases record everything and if you cross the wrong person, it can take your whole life down. If you think it’s bad now, just wait… the next step is integrating man and machine via neural lace technology. Terresa Monroe-Hamilton is a legacy blogger who specializes in politics and research on Marxists. She also reports on geopolitics and military subjects. Terresa is a constitutional conservative and writes for multiple media outlets including NoisyRoom.net, New Zeal and Gulag Bound.